Nokia recently released latest Nokia Software Recovery Tool free download for Nokia users. This latest tool is an official tool of Nokia which is released with new and advanced features for repairing or resetting your Nokia phones. This Nokia mobile tool helps you to recognize and repair software issues on Nokia mobiles. This tool is also able to repair, fix software issues and resolve mobile phone devices issues. Nokia Software Recovery Tool Windows allows you to solve problems of Nokia device, and installing the latest version of the firmware on your mobile device. The Nokia recovery tool can also display some critical information about your mobile devices such as the model number, IMEI number, and the firmware software version currently installed. This Nokia software recovery tool is simple and easy to use. The simple user-friendly interface with several options. The installation process is simple for Nokia users. Just click the given download link install this tool for your PC windows. If you wish to fix your mobile device issues, then you need to download and install this latest tool for your PC windows. After installation of this tool, you will need to connect the device via USB cable and follow the instructions on the screen. Be sure to make a backup of your files and data, because after completion of this process it will erase your all data. If you have a Lumia phone with Windows Phone. Then you need to use the Windows Device Recovery Tool instead. Now you can find it at the end of this post. 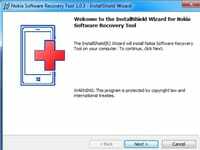 Nokia Software Recovery Tool is a free tool for Windows (32-bit and 64-bit) operating system. This mobile tool is compatible with all Windows versions like 10, 8, 8.1, 7, Vista and XP. So click the given download link and download Nokia Software recovery tool for free of cost.